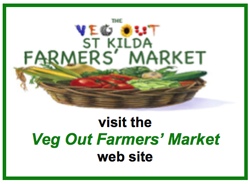 Veg Out is an organic, chemical free community garden run by volunteers and located in St Kilda, Melbourne, Australia. Formerly a lawn bowling green, the land Veg Out is situated on is administered by the local council for the State of Victoria, and has been permanently reserved for public use since 1881. We have over 140 garden plots, where members, friends, families and community groups enjoy getting their hands into the soil. Many have little or no gardening experience – but they soon learn, as advice, seedlings and friendships are readily shared. A commitment to a sense of community, conservation and organic gardening principles underpins all activities on the site. Unlike most community gardens in Melbourne, Veg Out lacks rigid barriers between common land and each plot; the paths curve and meander; flowers, vegetables and artworks have equal standing; the rabbits, chickens, budgies and quails add yet another dimension; and the friendships that have sprung up between gardeners, artists and visitors make the gardens an oasis of calm in one of Melbourne’s busiest tourist precincts. A very fertile and creative place.